A young man called Brian, stands in his smart business unit, having just invested his savings in this new business venture. It’s called “Grass Works” – a garden maintenance company., (This is a fictitious company for the purposes of this blog). The branded company sign emblazons the unit and the gleaming new lawnmower sits in the liveried trailer. Brian’s best friend helped distribute his colourful new flyers around the neighbourhood yesterday to help drum up some new customers. Already there are 2 new appointments in the diary! Brian happens to looks down at his tatty t-shirt and grass-stained shorts. It dawns on him that he doesn’t quite match the other branded efforts he’s gone to.One of his long-standing customers advice echoes in his ears – “you should get some poloshirts with your company name on and smarten yourself up a bit”! Brian decides to take a wander around the new industrial estate. He introduces himself to the neighbouring businesses. During a conversation with one such neighbour, he mentions branded gear, noticing they already have some smart t-shirts. Hey presto our name crops up! He’s a bit nervous to make that first call. 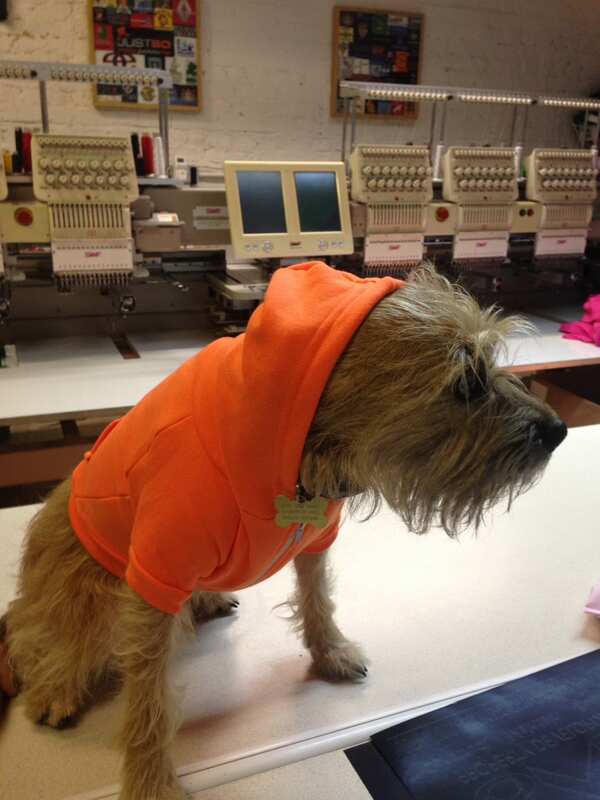 After all he knows nothing about branded workwear, how to order it and how much it will cost. Now, here at JUSTSO, we can relate to Brian. We’ve been where he is now, we’ve grown a business from scratch, and now we help hundreds of start up businesses, (and many other types as well), with good value branded workwear and useful promotional items. When Brian gives us a ring, we’re delighted to help.We are great at hand holding – not in a patronising way you understand. After all, we appreciate you’re experts in your business, but may not know a huge amount about branded clothing. You just want to get the best outcome in the shortest feasible time frame, so you can get on with running your company and that’s where we come in. We’ll brand you the best! Here’s a brief guide to ordering branded workwear, with suggestions to help make it easy and time- efficient. Useful for “Brian, and Grass Works” as well as any start ups. Indeed any business considering polishing up their “brand credentials” with clothing. Where is your logo? Do you have a logo or some idea of the design? Can you send us a copy somehow or pop in with something we could follow? How many people are you providing branded gear for? Do you have a specific budget, or do you want to find out what some options will cost to help guide you? Do you have a specific deadline for this potential order? We’ll produce a professional quotation for you, including images, specifications, prices and lead times, so you have everything in one place to reference. Often we can show you a sample of the items quoted so you can check out the garments. If you go ahead, we’ll raise the order paperwork, re-confirming all details to you in the process. 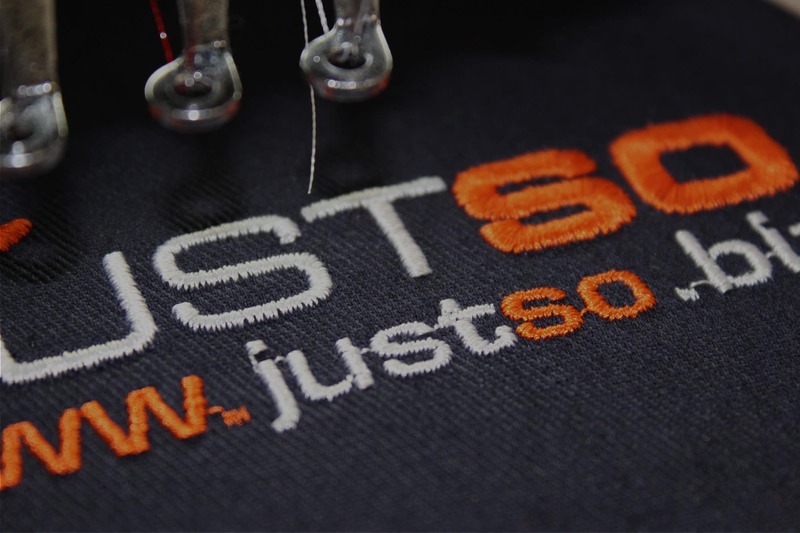 You’ll get an electronic proof of your logo in stitched format, and if you still need reassurance we can produce a physical embroidered sample for your approval. Our standard lead time is 7-10 days but we own our own production so we can meet tighter deadlines as well. When your order’s ready you’ll get an email and or phone call. You’re welcome to pick up the order or we can arrange an overnight courier service. A GREAT STARTING POINT- FOR BRANDED WORKWEAR! 3 poloshirts, 2 sweatshirts & 1 fleece embroidered 1 position for JUST £75.00 + VAT. This offer even includes the embroidery set up charge for your logo! We can supply clothing from a vast range OR you can bring us your items and we’ll just brand them OR mix the two! WANT TO TAKE YOUR FIRST STEPS INTO BRANDED GEAR (or retrace them if you’ve had branded clothing before and want a fresh new approach)…. GO ON- take action now for better branding! 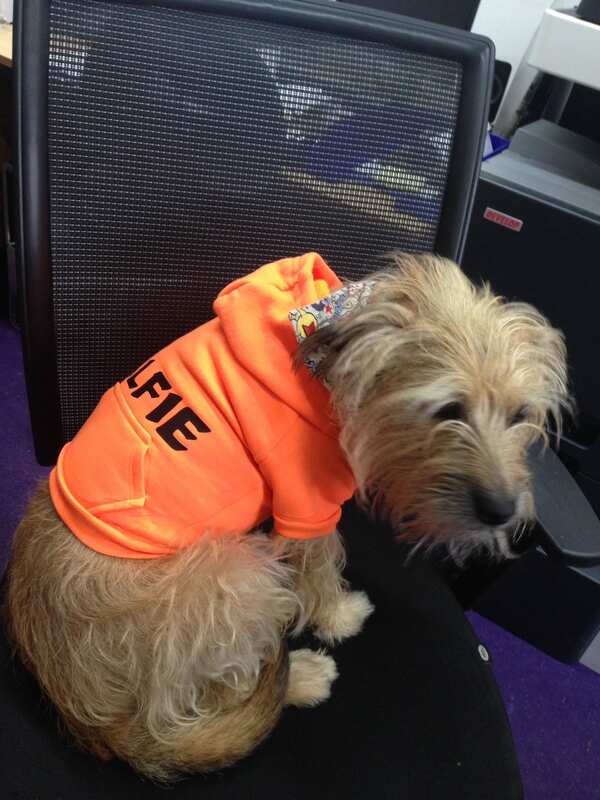 Our team of experts are ready and waiting, including Alfie the Office Dog!